A fully accredited public university serving the Chicago metropolitan area offering programs in the arts, sciences, business and education. View our employment opportunities and benefits information. Founded in 1867, Northeastern Illinois University has a rich tradition of educational innovation and prides itself on preparing teachers and administrators who make a difference in Chicago. That tradition continues to this day and has expanded to include an array of academic disciplines, allowing the University to embrace fully the community in which it resides. Northeastern is regarded as the most diverse public comprehensive university in the Midwest and is designated by the U.S. Department of Education as a Hispanic-Serving Institution. Diversity is an important factor in the character of Northeastern and in the social fabric of its student body. 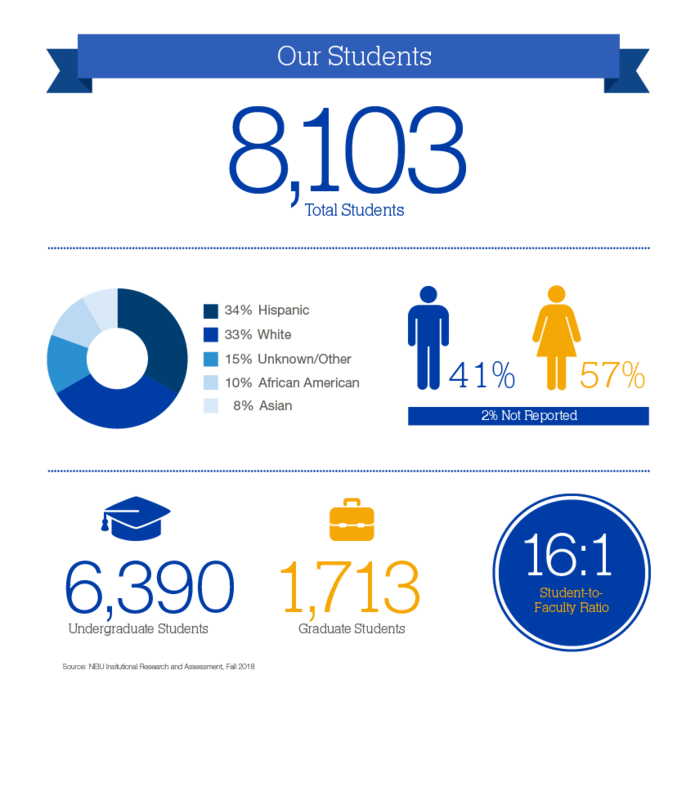 The University has an enrollment of more than 8,000 students; African American, Hispanic, Asian and Native American students represent roughly 60 percent of the student body. Newsweek magazine named Northeastern Illinois University the sixth “Best Investment” in the United States and No. 1 in Illinois. Northeastern shares the Top 10 with Harvard, Stanford, Princeton and MIT. In U.S. News & World Report’s “Best Colleges” publication Northeastern is ranked the most ethnically diverse public regional university in the Midwest. Diverse: Issues in Higher Education’s annual “Top Degree Producers” demonstrates that Northeastern is a leader among American universities for the number of bachelor’s and master’s degrees earned by students of diverse ethnic backgrounds.